Heidenheim and Union Berlin meet at Voith‑Arena, in a match for the 26th round of the 2. Bundesliga. These teams have tied (1‑1) in the last head‑to‑head for this edition of the league, played on 07‑10‑2018. The head‑to‑head history at this stadium, favours the home team, since in the last 5 head‑to‑heads they won 4 and lost 1. Accordingly, in the last head‑to‑head played at this stadium, for the 2. Bundesliga, on 18‑11‑2017, Heidenheim won by (4‑3). A. Feick (44' ), J. Verhoek (61' and 74' ) and M. Schnatterer (66' ) scored for Heidenheim and S. Polter (63' ) and S. Skrzybski (72' and 75' ) for Union Berlin. The home/away factor is worth special atention, since although this is a match between 6th and 2nd of the league table, it’s also a match between the 7th best team in home matches and the 8th best in away matches. After 10 wins, 9 draws and 6 losses, the home team is in the 6th position, havinf won 39 points so far. In the last match, they have lost in an away match against Bochum by (1‑0), after in the previous match they have lost (1‑2) at home, against Jahn Regensburg. This is a team that maintains its competitive levels in home and away matches, since they have had similar results in both conditions. In the last 10 home league matches Heidenheim has a record of 6 wins, 2 draws and 2 losses, so they have won 20 points out of 30 possible. They haven't been very strong defensively, since they have suffered goals in 8 of the last 10 matches, but their offense has scored frequently, since they have scored goals in 8 of the last 10 matches for this competition. They have conceded the first goal in 9 of their 25 matches for this competition, and have only turned the score around in 2. It is very positive the moment lived by Heidenheim, after all they are not far from the zone of the playoff of access and from now they value the regularity until the end of the competition, after all they have goals to achieve. The hosts will not have ease in this confrontation, because their opponents also have goals of their own, but it is clear that they will enter the field focused and determined to get a favorable score. With attitude, determination and efficiency they can celebrate a positive result at the end of the duel. For this match coach Frank Schmidt will not be able to count on Robert Leipertz who is in the medical department. Confirmed Lineup: K. Müller, T. Beermann, M. Busch, P. Mainka, N. Theuerkauf, N. Dorsch, S. Griesbeck, M. Schnatterer, N. Dovedan, D. Thomalla, R. Glatzel. The away team is currently in the 2nd position of the league, with 47 points won, after 12 wins, 11 draws and 2 losses. In the penultimate match, they won in an away match against Holstein Kiel, by (0‑2). In the last match, they won in a home match against Ingolstadt, by (2‑0). This is a team that usually makes good use of the home advantage, since they have won 16 points in away matches and 31 points at their stadium, with 26 goals scored and 6 goals conceded at home, against 15 goals scored and 15 conceded in away matches. In the last 10 away league matches Union Berlin has a record of 3 wins, 5 draws and 2 losses, so they have won 14 points out of 30 possible. Their offense has scored consistently, as they have scored goals in 9 of the last 10 matches for this competition. In 25 matches for this competition, they have conceded the first goal 5 times and have never been able to turn the score around. The balance is high at the top of the table and Union Berlin know the need for regularity, so much so that they are struggling for access and do not want to change that. In the field, they try to impose themselves, marking firmly and attacking efficiently, as they run less risk of being surprised and increases the probability of a positive score happening. Even playing away from home know they have the conditions to get something good and will fight until the end of the game to conquer points, or rather will do everything to conquer the victory. For this match, coach Urs Fischer will not be able to count on Sebastian Polter and Carlos Mané who are in the medical department. Confirmed Lineup: R. Gikiewicz, M. Friedrich, K. Reichel, F. Hübner, C. Trimmel, R. Zulj, M. Schmiedebach, F. Kroos, M. Hartel, A. Gogia, S. Andersson. 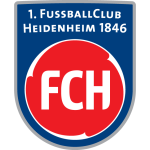 Coming from four poor results, Heidenheim hope to show a better football on the pitch in the next round so they can score points and rise on the standings. Union Berlin are trying to stay within the qualifying zone, so even playing away from home is important not to waste points. We see this as a very balanced match and with two teams giving the maximum within the four lines, to achieve the desired result. We will bet that both teams will score goals until the end of the game.